I stand on our balcony and look down. Two boys are hard at work. The balcony is on a pier on the river. It’s a bright blue day with the glowing Manhattan skyline spread out on one side. The Verrazano-Narrows bridge is strung like a pencil sketch on a bright blue canvas on the other side with little beads glinting in the sun at the base that are really cars passing from Staten Island to Brooklyn on this sunny day. The magnificence of the skyline and the slowly moving glinting dots on the precariously strung bridge, seen from this distance, seem like evidence of both the grandeur of human civilization and human hubris to a casual observer. Straight down below me is a narrow strip that goes all around the apartment building filled with mulch and motley stones and bits and pieces of what look like wood shavings. This is soil for the transplanted shrubs meant to take root here and make this building beautiful. Every season I see the gardeners come by and uproot them and replant the strip with other plants more suitable for the season. This isn’t a place where plants, not in the season of their bounty, can lie dormant until next spring when they bring out a new green shoot. Hardworking gardeners with electrically operated machinery periodically tear them out, level the ground and replant the plots with new plants that have been grown from seed elsewhere to beautify this place. Transplanted plants are perhaps eagerly sent here because their beauty matches the beauty of this place, some perhaps carefully bred for this very reason. This area is beautiful. Signs on placards all around advertise that it is ten minutes from Manhattan’s financial district. Pictures on the walls of the lobby depict men and women suitably dressed enjoying a drink against the magnificent view of the river and the skyline–smiling neither too much, nor too little–just enough. It is late afternoon and the boys keep criss-crossing the strip of concrete that covers the boardwalk. 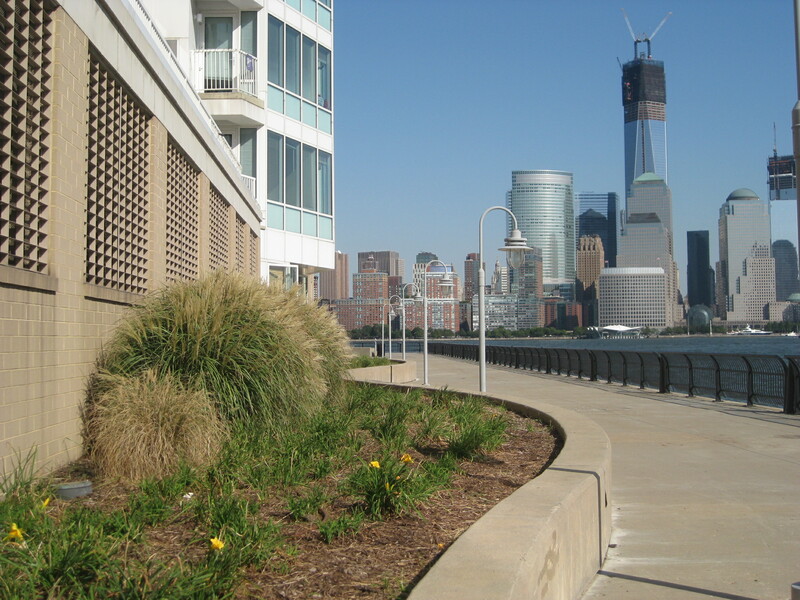 The mulch borders one side and the railing on the river’s edge borders the other side of the strip. They pick a stone each very carefully (or maybe a wood shaving) from this makeshift soil, walk or run across the strip of hard ground and throw it in with all their might into the river across the railing. On their way they run across various impediments in the form of curious dogs on their afternoon walks claiming a lamp post, serious joggers with pedometers on their arms, little girls on pink tricycles and colour coded babies peeking out of their strollers. 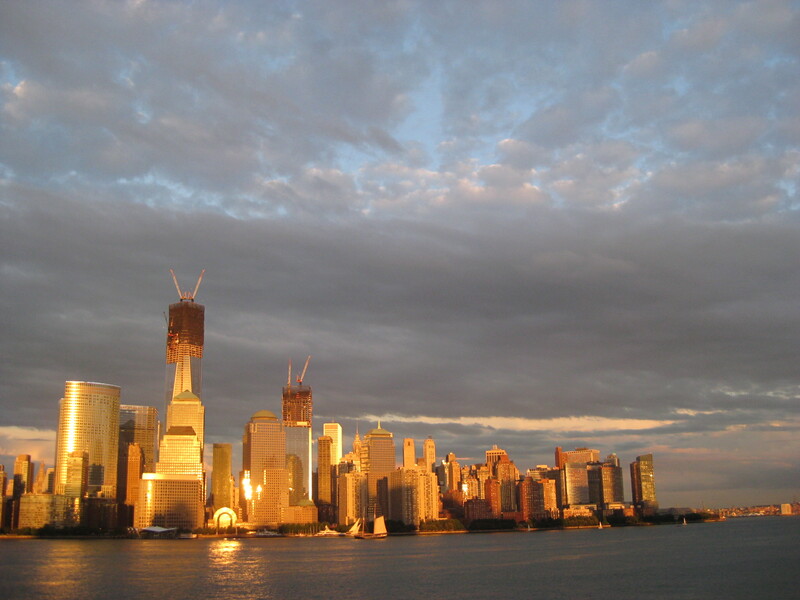 You can tell the regulars by their concentration on whatever it is they are doing–walking, running or cycling–by their nonchalance towards the grey or gold or multi-coloured great Manhattan skyline on the other side of the sparkling river depending on the time and brightness of the day. “Look how hard I can throw this,” says the taller boy as he swings his arm with all his might over the railing. “I can throw harder,” says the younger one. Unfortunately, a wood shaving does not fly as far as a stone. It does not make as big a splash. So back they both run to find the next one. From where I stand, I can only see the tops of their heads. One is taller than the other but both are surely between six and eight years old. One is fair-haired with a lot of curls, the other with brown hair cut short. They seem quite unsupervised and ideally placed to set the rules of their own game working hard at it with untiring concentration. My mind flies back to an identical game I had witnessed many, many years ago in Sealdah, Calcutta. Except that I am surrounded by metal “grills” (not barbecue grills but protective wrought-iron coverings on open spaces to keep intruders out) in the balcony, looking down at a compound in a housing complex with a Shiv Temple right below, some grass-covered patches and two dark haired boys, dressed rather like two tiny adults in shirt and trousers, playing this very same game. They are younger. One can hardly walk. They walk to a heap of construction material comprised of sand and shingles accumulated on the side of a grassy patch. I can’t hear what they are saying to each other but they pick one shingle after another walking or toddling over to an open drain running around an apartment building, or “flats” as we called them, and throwing them into the water. Over and over and over again they go on and on. I know they live in one of these buildings and the servant who supervises them is perhaps somewhere chatting with another servant out of sight. Calcutta is also magnificent in the afternoon for those who can see its beauty. Buckets clang in the background as servants collect around the water tap to collect drinking water. As I hear that sound I can almost smell the humid air of the cool afternoon from home. I don’t know why little boys play this game of tossing stones into the water. I don’t know what the game meant then, I don’t know what it means now. It occurs to me that those Sealdah boys aren’t boys anymore. They are probably young men now, even not-so-young anymore. I don’t know where they are, what they are doing. Perhaps they became doctors or engineers as most boys in that compound of ours did, a compound we still call the Railway Colony since railway officers lived there with their families since British times. Or perhaps they grew to be only good at games, not so good at jobs, still dependent on their parents, playing unsupervised games. Or perhaps they are here in New York, playing big boy games in the big city living in one of these buildings ten minutes from Wall Street. Perhaps I’ll meet them one day in my walks on the boardwalk. Will I recognize them amidst all this newly-created transplanted beauty remembering our mutual time a long time ago in a Railway Colony at the other end of the world? Very informative post. The pictures are fine. Thank you for good writing. Sometimes I feel like those transplanted plants. Lovely post, as always! Makes me want to return to Manhattan where I called home. And how great is it that the two boys took you back in time and place. Thanks for reading. It’s always pleasant to make people feel what you felt.